Even with the advent of Qlik Sense Security rules in the QMC you may find yourself working with Section Access. Maybe you don’t have a server, maybe you want to guard against users just taking the QVF file (and all your data with it) or maybe you want to implement section access reduction. it was the latter that prompted the bog, seeing an interesting behaviour for the first time took a bit of investigating. Either way the functionality can be tricky to implement. 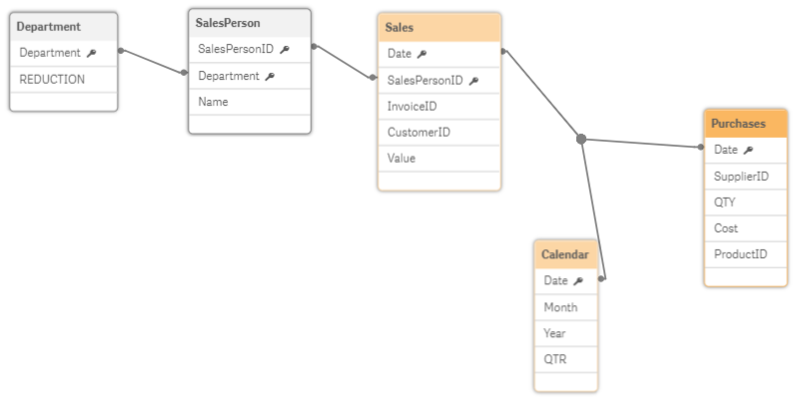 You often have you test various circumstances to see what works and in the process it wasn’t uncommon (back in QlikView) to lock yourself out of your own dashboard. Lets focus on the first…… Setting up Section access is simple. You just need a table loaded in from any source (inline, CSV, database, etc) and the table has to be constrained within Section Access; and Section Application; statements. We now have an additional field REDUCTION which would link to TableA by the field with the same name, in turn that would also link to TableB by the field Type. Because our user only has the REDUCTION value of 1 when we reload the data, save and close the dashboard and re-open there will only be one record in both TableA and TableB. Here the REDUCTION starts on the left hand Department table so I’d have grouped staff USERID’s by the department they work in. We move through the model reduction the data by possible value. 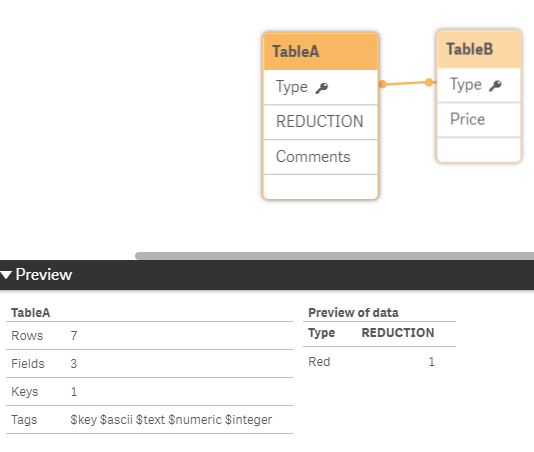 This works well for the first three tables and users will only be able to see the sales data associated with their department. If you consider how the next link will work… In this example I want all staff to see all purchases but this isn’t the case here. If you follow the logic both the Calendar and Purchase Tables will now only have records where there’s been a sale on the same date (and then only sales which associate with the person opening the dashboard) which isn’t what we want. In order to resolve the issue we need to add dummy records to the sales table. One for each date there’s been a purchase duplicate those for each SalesPersonID. We can of course add a flag to ensure that data isn’t used in any counts or sums…. If you have other people that need to see 1 or 2 then of course you don’t need dummy lines but if you do use star * then you have to ensure all possibilities are covered in the section access table even if that means using a dummy record. This is what caught me out recently! Now when we reload, save and re-open the dashboard the field comments still shows in the data model viewer although when you preview the data it’s gone (see below)! We can repeat the process to remove more columns. So effectively rather that saying what records we want to keep using REDUCTION we are saying what we want to remove by using OMIT! Pretty powerful stuff and remember this is available for free in Qlik Sense desktop. If you buy server licenses you get the QMC and even more power over what users can see by hiding sheets and objects using the security rules! ← Could you be a Qlik contractor? isn’t there something as “open app without data” that prevents getting locked out if you have editing rights?